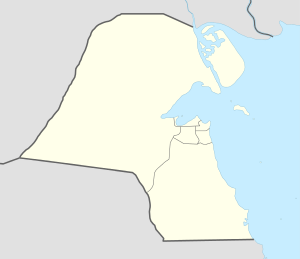 Camp Buehring (formerly Camp Udairi) is a staging post for US troops in the northwestern region of Kuwait. From its founding in January 2003 to present date, the base was used for military troops heading north into Iraq, as well as the primary location for the Middle Eastern Theater Reserve. The areas surrounding Camp Buehring, known as the Udairi Range Complex, are largely uninhabited, save for a few nomadic Bedouin tribes raising camels, goats, and sheep. Camp Buehring is named after Lieutenant Colonel Charles H. Buehring who was killed in Baghdad on October 26, 2003. Buehring was one of the highest ranking U.S. casualties of the Iraq War. Camp Udairi was renamed in his honor in 2004. 48th Air Brigade - may be incorrect. 1 2 AirForces Monthly. Stamford, Lincolnshire, England: Key Publishing Ltd. March 2016. p. 56.